The LEGO® Movie 2 is now in cinemas! 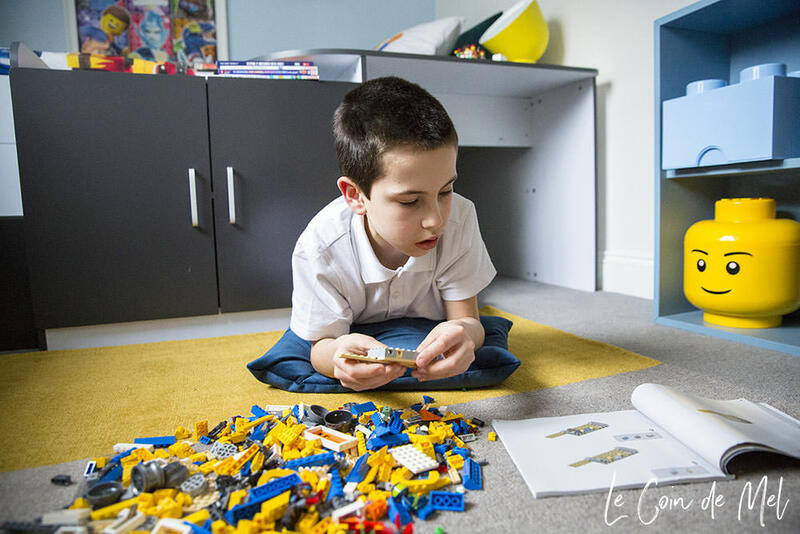 How about a LEGO room makeover in partnership with DFS to celebrate? When we had our loft conversion done three years ago, our two-bedroom home became a four bedroom house. That meant Crevette could get his own bedroom. Crevette’s new room was the last one to be decorated and he was really happy to get his own space. All the money had been spent on the loft conversion itself. We had to get new carpet for all the bedrooms, paint, tiles, and bits and bobs. Needless to say, jazzing up Crevette’s bedroom wasn’t on the agenda. Crevette’s room had to be done on a tight budget, with no conscious effort to give it a particular style or theme. My friend Aimee gave us the bed. I bought a mattress, desk and wardrobe and everything else was from the bedroom he’d shared with his three sisters. 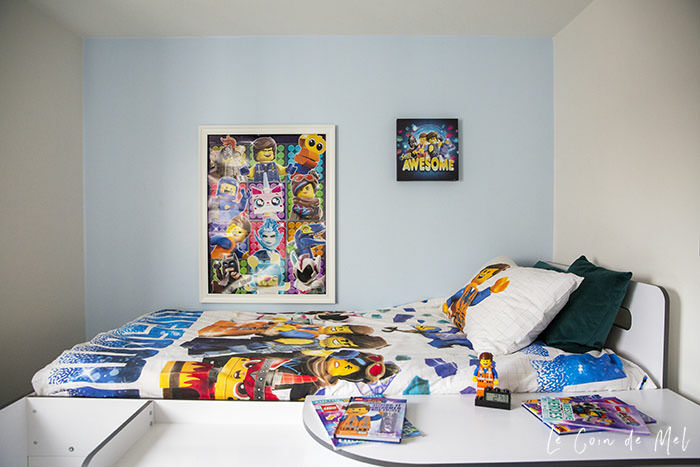 When DFS and Warner Bros. suggested giving my little man’s room a makeover to celebrate DFS’ partnership with The LEGO® Movie 2, turning it in to the ultimate LEGO bedroom, we were over the moon! 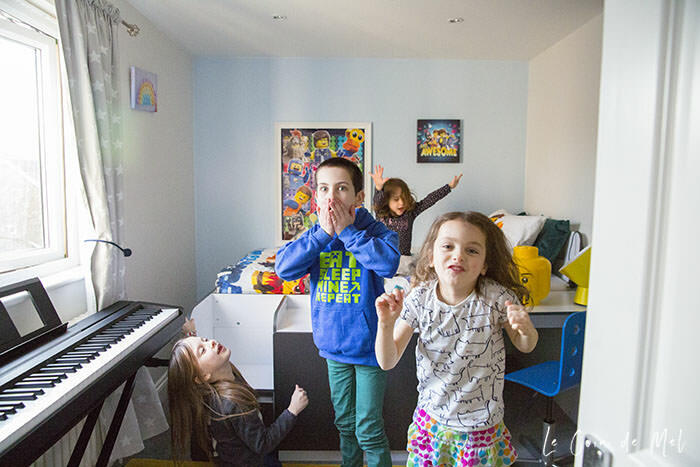 What 10-year-old wouldn’t want a LEGO bedroom? 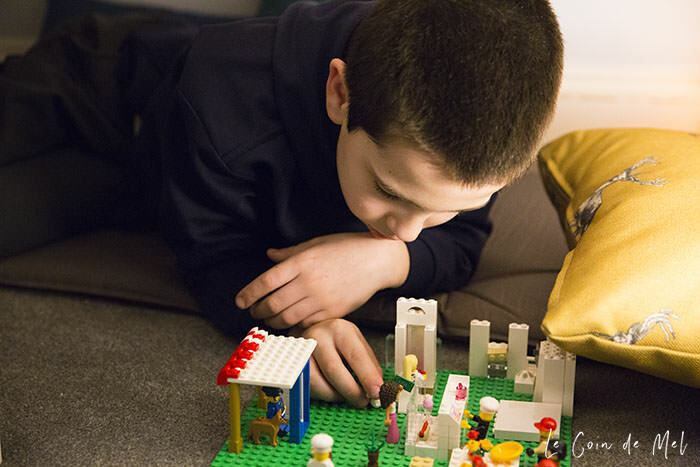 Check our practical top tips for turning any room into a LEGO bedroom. Now I know it’s not always possible, but I think there’s nothing like completely emptying a room so you can really sort everything out. Failing that, try your very best to move all furniture so you can give the skirting boards and carpet a thorough vacuum and deep clean. 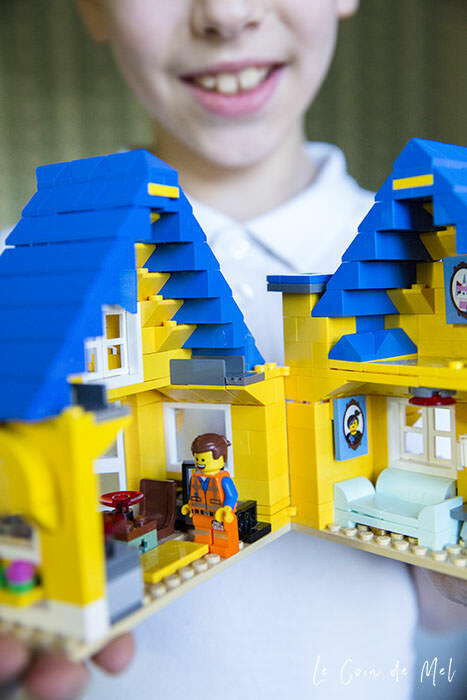 You might also find some long-lost treasure, a LEGO character or two (and a fair few cobwebs). The first thing Crevette and I did was move his mattress to the girls’ bedroom. 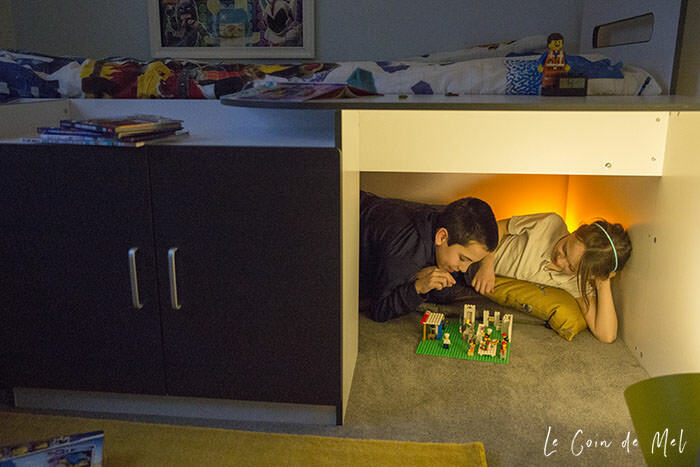 He slept there for a few days whilst I was turning his plain bedroom into a LEGO heaven with cosy DFS furniture. I then took photos of his old wooden bed and gave it away on Freecycle. I love Freecycle because it means the things we no longer need can go to people who need them. You get rid of stuff and it can be given a second (third in this case) life or be repurposed. Whenever I do a bit of a room makeover, I tend to fix bits and bobs and repaint it. Crevette’s room was only built and painted three years ago, so it was still pretty spotless. I’ve only touched up a couple of areas, but nothing dramatic. I also think the light blue and white on his walls, coupled with his grey carpet, work really well with the pop of colours you get with LEGO. Thank goodness, Crevette isn’t as bad as the girls and we were ruthless when we sorted everything out. We moved absolutely everything (apart from the wardrobe) into the master bedroom. That gave us a neutral space in which to make decisions and properly sort everything. It also meant that he didn’t have to go in his bedroom as his new bed was being built and other bits and bobs delivered. I’d just done his wardrobe ‘check’ so that was one thing off the list. We gave his desk a big clean and it went to the girls’ bedroom. His keyboard and guitar were dusted and he then sorted his books. He just had to decide which ones he wanted to keep and which ones could go to his sisters. Then we moved on to LEGO. He has A LOT of LEGO. Thank goodness it was all in large LEGO bricks storage. I bought an extra one with drawers for Crevette so he could do what was on his mind: sorting all the pieces into colours. It took forever but everyone took part in the process, even friends coming over for playdates. All LEGO bits went through a fine-tooth comb. We got rid of the bits and pieces that had made their way into our LEGO. I shared the LEGO theme with Crevette, but kept the final design a secret. 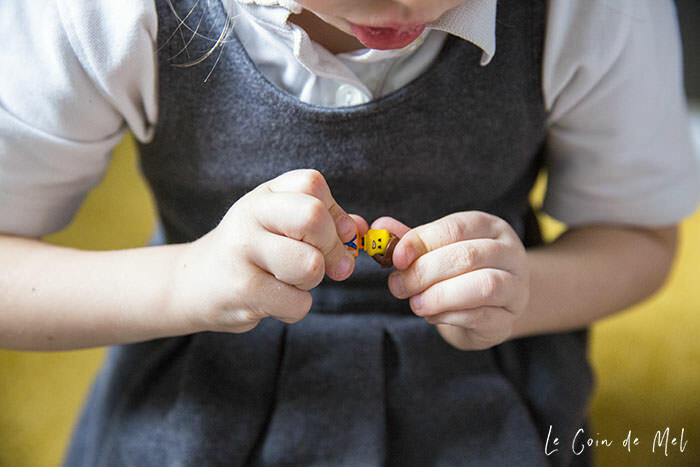 I always think that a bit of anticipation can bring a bit of magic into my children’s lives so as much as I can, I try to let them speculate and use their imagination when possible. My little man and I agreed on the LEGO theme, general colours for bits and bobs (grey and mustard yellow for the DFS Robin rug and DFS Pluto armchair) but he was really excited his LEGO bedroom would be a surprise. He obviously knew there would be some link to the LEGO MOVIE 2 but was happy to wait and see. Look at his little face when he first went in yesterday! Crevette oozes positivity and awesomeness, so The LEGO MOVIE 2 theme was a no-brainer. We attended a screening of the Warner Bros. film on Saturday and we all loved it! In the LEGO world, the invaders (DUPLO) have turned Bricksburg into Apocalypseburg, and they continue to invade again and again. Emmet Brickowski remains upbeat, wanting to move into a dream home with Lucy, while most of the citizens have turned into hardened fighters. 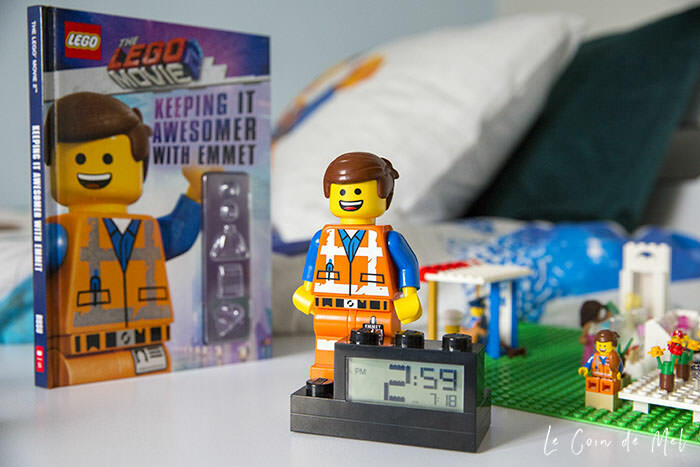 Crevette, like Emmet, believes in eternal positivity and restored harmony, so I wasn’t remotely surprised when he announced that Emmet was his favourite character in the film. Crevette’s room is the smallest bedroom in our house and it’s rather compact, so I was over the moon when I realised the cabin bed would fit widthways. That saved so much space, and his room, despite having more imposing furniture, now looks much more spacious. Storage was my main focus when picking Crevette’s bed, mostly because his bedroom used to always look like a bomb site before. LEGO would be in plastic boxes under his bed, his bookshelf always looked messy and his desk… well, don’t get me started about his desk. When I saw DFS’ Caden bed, with its clever storage solutions, I knew it would be the perfect bed. Not only did it come with an integrated desk that would be space-saving, but it also had a deep cupboard in which he managed to fit all his books, a clever drawer on the stairs (pyjama drawer!) and two drawers on the end of the bed. The children’s favourite thing has been the space under the bed, which they’ve been using as a den and sleepover station. It is perfect! 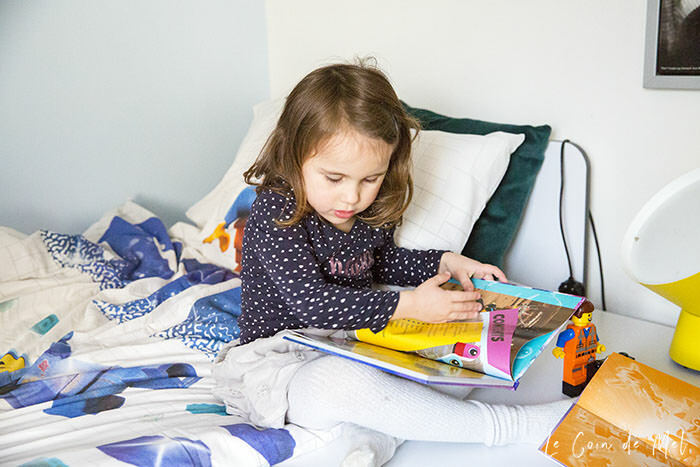 As a parent of very messy children, I love the streamlined look of the cabin bed and the fact it is full of nooks and crannies to put things away. It means being able to store lots of things whilst keeping a tidy and clean look in the bedroom. There’s now a place for everything and Crevette’s old messy bookshelf has been repurposed as a LEGO-organising station. We had a number of brick boxes and heads already and I found the yellow brick with the drawers last week, to Crevette’s delight. The desk / bedside table also remains tidy because we are using a basket to store school essentials next to his books (in the cupboard). He’s happy, I’m happy, everyone is happy! I really think it’s important to instil a love of reading in our children and encourage them to be screen-free (link), just reading, enjoying the silence and calm and how amazing it is to ‘get lost’ in a good book. 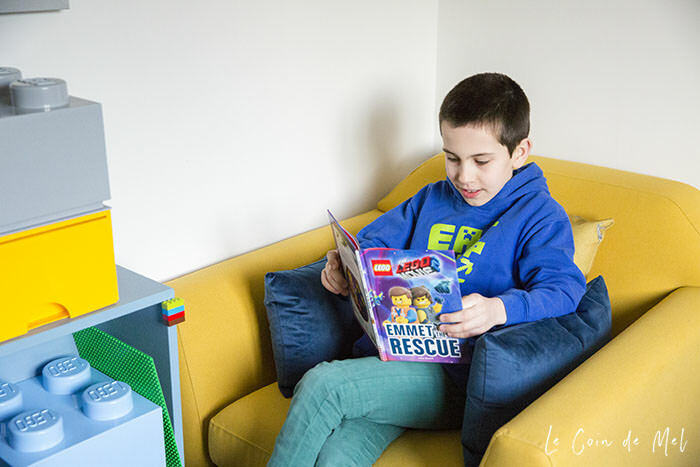 Crevette is an avid reader and he was speechless when he saw the DFS Lemon Pluto armchair in his ‘new’ room. I want it though. Am I a bad mother if I steal it for the living room? Maybe in a couple of months? My four play in their bedrooms a lot. I used to have toys all over the house (we don’t have a playroom), but last year, I decided to reclaim the living space downstairs and put all their toys in their rooms. They don’t just sleep in their rooms: they play hide and seek in the dark, make dens, play teachers and pupils, laugh, cry, argue and generally make a lot of mess. I just close the door. Playing is part of growing up and I love the fact my four still play all together. At 10 years old, my little man might be growing up, but he’s still a child and I wanted to leave room for imagination in his newly decorated space. The den under his bed has a makeshift mattress, his Google Home Mini, lights and lots of DFS cushions. It makes me want to be a child again. Maybe I’ll have a sleepover in there soon! When you pick a timeless theme like LEGO, it’s great because you don’t have to start from scratch. The primary vibrant colours are timeless and go with pretty much any wall or floor colour. Everyone I know already has LEGO. The Danish plastic bricks date back from 1932, before my grandparents were even born. My mum played with LEGO, I played with LEGO, my children play with LEGO and my children’s children will probably play with the little bricks too. They are practically indestructible. 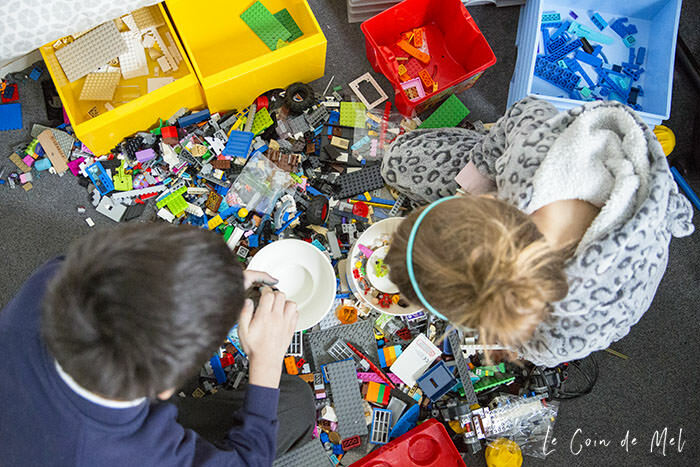 Before you shop for new things for your LEGO theme, look at what you’ve already got (hence the decluttering above!). Now you’ve done all of the above, you’re allowed to hit the shops! It’s nice to get a few items that are on trend. The Emmet love is strong here so we’ve gone for the whole shebang: duvet set, posters, canvas, books and alarm clock. I hope you enjoyed my latest makeover project. 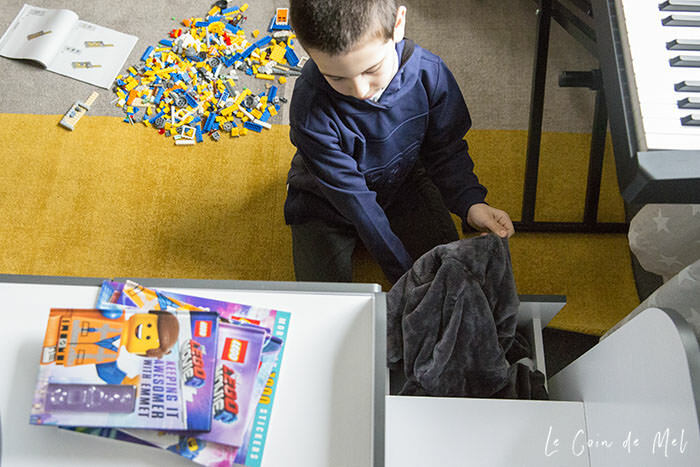 It was so much fun to decorate and style Crevette’s bedroom using DFS furniture and The LEGO® Movie 2 accessories. 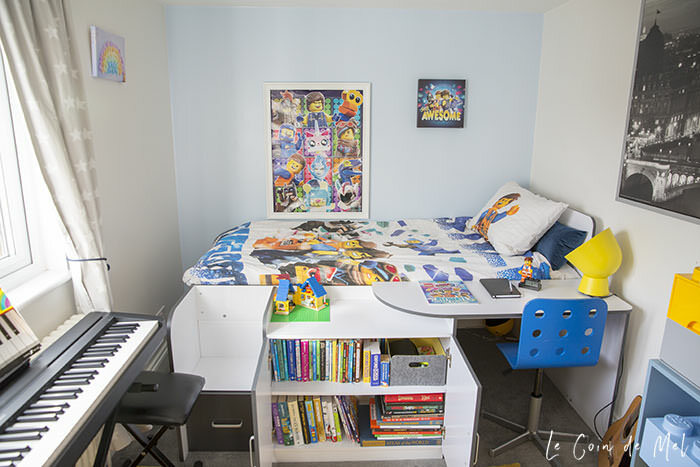 Would you have a LEGO bedroom in your house? Is there anything else you would include in yours? Disclosure: This is a sponsored post. We were also gifted all DFS and most LEGO products and invited to an exclusive screening of The LEGO® Movie 2 but all photos and opinions are my own. 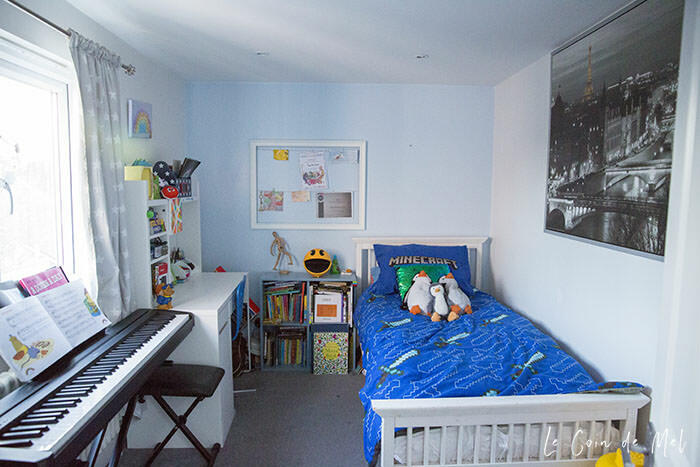 Apocalypseburg, Bricksburg, cabin bed, Caden Bed, colourful, cushions, DFS, Emmet, Emmet Brickowski, interiors, kids' bedrooms, Lego, LEGO MOVIE 2, loft conversion, makeover, Pluto armchair, reading, rug, storage, Warner Bros.
You’ve done a great job, Crevette’s room looks amazing. I love cabin beds too, I’m sure your four will have endless fun in the little fun underneath it. We’re also looking forward to seeing the Lego movie this half term too. I want a reading corner and a den! 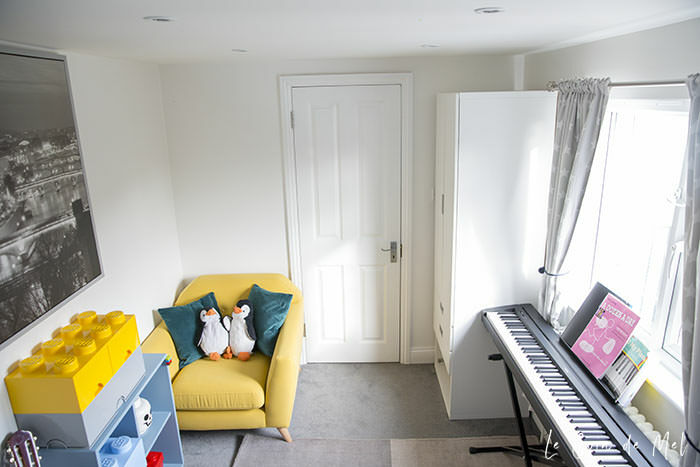 Erm, I mean, for my child… What a fun room. I hope your children enjoy it and you enjoy having your front room back. I want a den and a reading corner too!! We can’t wait to see the LEGO Movie 2. I love what you’ve done with the bedroom. It’s a brilliant movie for the whole family! We all loved it! My 8 yr old can’t wait to see the new Lego movie! He would love a room makeover like this. It’s a brilliant film for the whole family! Wow his room looks amazing with a capital A. I want one like it! I’d love to create a Lego room for my son in a few years. It was my favourite toy growing up and I’m sure it’s going to be his too. That permanent den is their absolute favourite bit in the room: little man’s sisters love ‘camping’ under there! 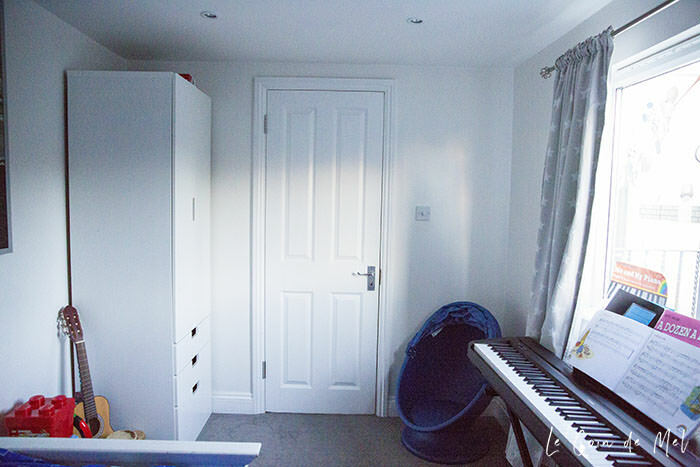 The makeover has been brilliant for space-saving, decluttering and I love the new storage solutions in my little man’s room: it’s so much easier to keep it tidy now! Really cool idea and lovely post. Can’t wait for more!